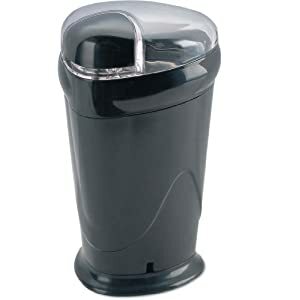 The Andrew James Andrew James Coffee, Nut and Spice Grinder is a fantastic grinder at an affordable price. It is powerful, efficient and fast as it can grind coffee, nuts & spices with a minimal amount of effort in around 15 seconds. Perfect for grinding fresh coffee beans, nuts and spices and come with a a large capacity 70gramm compartment which will grind enough coffee to make 10 cups of coffee. 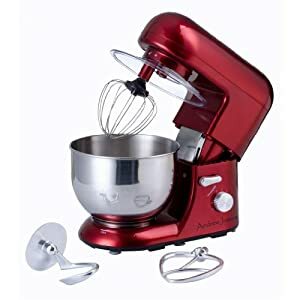 It comes with a powerful 150-Watt motor with is controlled by a push button control for easy operation The blades are Stainless steel and the lid is transparent so you can see what you are grinding. All in all the Andrew James Coffee, Electric Nut and Spice Grinder is quiet, compact and easy to store, and can be cleaned with a damp cloth and most importantly affordable. Making Ice Cream with the Andrew James Professional Fully Automatic Ice Cream Maker could not be simpler or tastier and can be ready in just 60 minutes. The recipes that are included in the free 128 Page Ice Cream Maker Cook Book are excellent and give you tips and examples so you can make your own recipe ice cream. Assembly is quick and easy, and I you will soon have the basic recipe ice cream churning away. It is also very quiet and easy to clean. Simply fill the bowl with the ingredients switch on and set the machine running. Using the Large Capacity 1.5L ice cream Bowl your Ice Cream can be ready in less than 60 minutes. Another added advantage is that the bowl does not need pre-freezing. As well as making perfect Ice Creams, you can also make frozen yoghurt, sorbets, Italian Ices, Chilled soups and Frozen slush drinks. Why not add your own natural ingredients for the perfect ice cream. The window allows you to add nuts, fruits, chocolate chipsduring the churning process. The powerful mixing mechanism and strong motor make light work of the job in hand. The electronic control panel with LCD display is easy to start and stop the machine as well as allowing you to use the preset programs as well as displaying the inside temperature and time remaining. 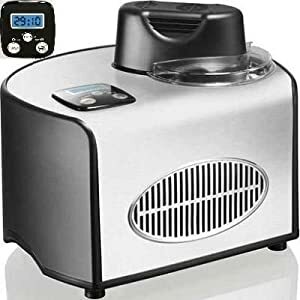 The ice cream machine also turns itself off when complete and has an extended cooling function that stops whatever you are making from defrosting when you are not around. All in the all the Andrew James Professional Fully Automatic Ice Cream Maker is simple to operate and produces brilliant results.